St Barnabas is as pleased as ever to welcome back for your entertainment, the now well established South East London Orchestra. Performing for their fans, members of the locality and you, their early summer concert will enchant you with Mendelssohn’s A Midnight Summer’s Dream Overture. 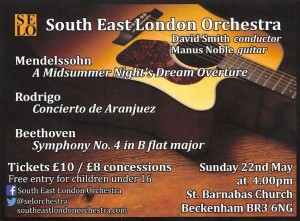 If that were not enough, ‘SELO’ will perform Rodrigo’s acclaimed Concierto de Aranjuez for the first time at St. Barnabas, topping off an afternoon you’ll want to remember with Beethoven’s Fourth. We hope you can join us for this afternoon with some of our most regular performers.